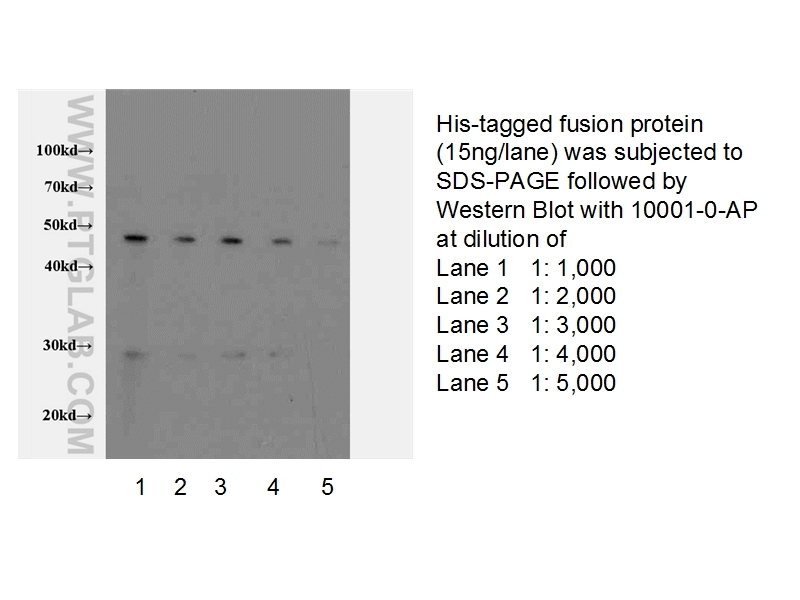 Western blot of 6*His-tagged fusion protein with anti-6*HIS tag (10001-0-AP) at various dilutions. Protein tags are protein or peptide sequences located either on the C- or N- terminal of the target protein, which facilitates one or several of the following characteristics: solubility, detection, purification, localization and expression. His tag is often used for affinity purification and binding assays. Expressed His-tagged proteins can be purified and detected easily because the string of histidine residues binds to several types of immobilized metal ions, including nickel, cobalt and copper, under specific buffer conditions. The antibody reacts specifically with the 6*His tag fused to recombinant protein. Crystal structure of Human ASB9-2 and substrate-recognition of CKB. Silencing of OSBP-related protein 8 (ORP8) modifies the macrophage transcriptome, nucleoporin p62 distribution, and migration capacity. Regulation of the transcriptional activation of the androgen receptor by the UXT binding protein VHL. An important amino acid in nucleoprotein contributes to influenza A virus replication by interacting with polymerase PB2. Regulation of energy homeostasis by the ubiquitin-independent REGγ proteasome.